Sometimes you just want to go the extra mile with your aquatic pets. 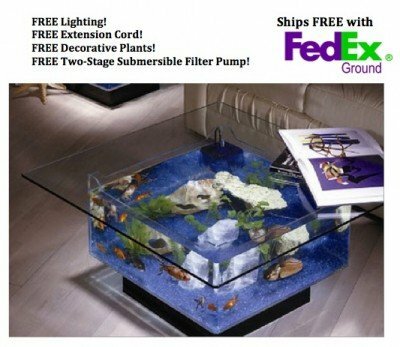 You’ve probably even seen fish tank tables on popular furniture sites. These are beautiful pieces of furniture that few people have in their homes. Sadly, this can make buying one harder. To help make your shopping process easier we went out and researched these tables. 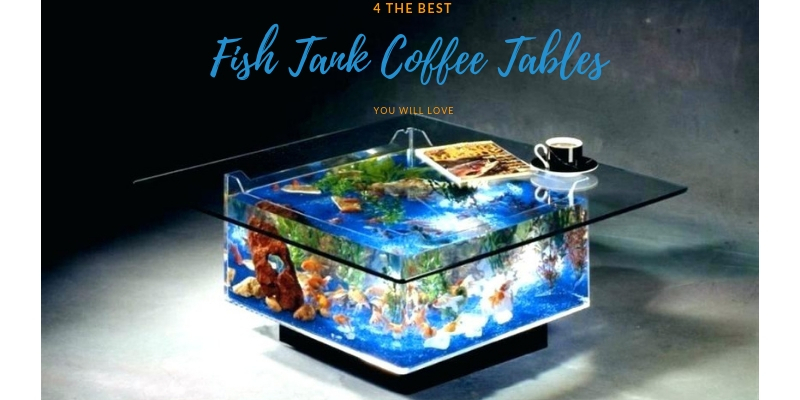 Below we selected 4 of the best fish tank coffee tables on the market. We even listed everything you need to know about them as well as there cons. 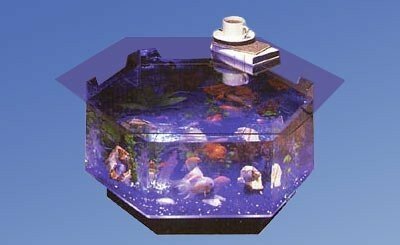 To start with let’s take a realistic look at purchasing a fish tank coffee table. There are some great benefits to owning a table and some cons as well. This section will weigh the pros and cons against each other to help with your decision. Let’s start with the pros first. To start with these tables are simply gorgeous. They look luxurious and will make any room there in pop. The luxury of having your fish tank as a centerpiece is also quite nice. Decoration wise these tables are a great choice. These tables also put the fish in the middle of your daily life. This makes you pay more attention to your aquarium. This can be great for helping you maintain your aquarium’s health. You will even be more inclined to keep the water crystal clear. The cons for these tables should be considered just as much though. These tables are not going to be cheap. These tables are an investment that you may need to save up for. If you see a cheap model, they usually aren’t made to last. Secondly, these tanks aren’t going to work well with many accessories. Thanks to the unique design you will have trouble find accessories that won’t look bulky. Cleaning may also be a hassle to thanks to the amount of space. Overall though, these aren’t horrible tanks in general. You will need to think about Maintenance and the cost of special accessories. to most people, the beauty of having a clear tank as a centerpiece outweighs the cons. Even the price tag isn’t too outrageous. The Midwest Tropical AquaTable Aquarium Octagon is the first item on our list. 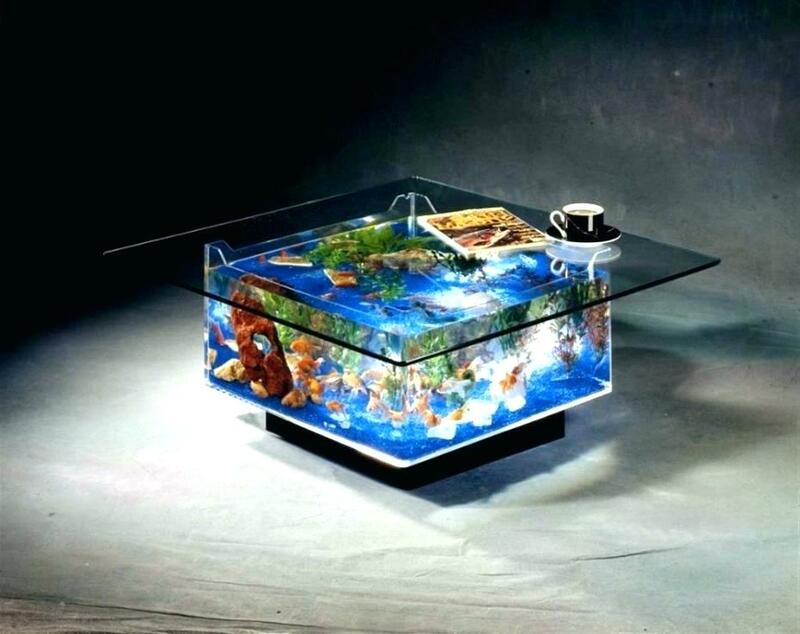 This fish tank coffee table will make the perfect centerpiece for your room. No matter who you have over they will simply fall in love with your newest piece of furniture. This tank measures 40 x 23 x 21 inches and weighs around 56 pounds in total. You should note that when water is added to the table the weight will greatly increase. This tank has a capacity or 28 gallons, a great size to house small fish or some medium species. This table has a feeding slot built in to make it easier to feed your fish. This is a freshwater only tank though. This table has 6 sides so that you can admire your fish from just about any angle. The tank is made with a mix of glass and strong acrylic for the tank. The glass is made to be durable against cracking and is put on top of the table. The materials are crystal clear to provide excellent viewing. With this table, you will get a Filter, plant, blue glass gravel, and a light for under the tank. This gives you everything you need to upkeep your new tank. This table does have some downsides. If you need to add in a heater it may be tough. This table has no way to really hide wires for extra accessories. This table is also one of the harder models to clean. This can make owning the table tedious over time. 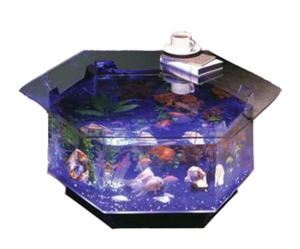 The Long Octagon Aqua Coffee Table Aquarium is another gorgeous product. This is a larger table that can hold some medium to larger breeds of fish. This paired with the wonderful design is a great choice for fish enthusiasts who like bigger breeds. This table measures 30 x 30 x 16 inches and weighs around 90 pounds. This table can hold up to 40 gallons of water. This makes it one of the biggest fish tank coffee tables made so far. The table itself is a hexagon shape. This gives you multiple angles for viewing. This tank is made out of acrylic. Even the top of the table and the base are made of this durable material. This guarantees that the table can be used without breaking easily. It is suggested that this tank only be used for freshwater environments. With this tank, you will receive the following items. A pump, lighting, extension cord, decorative plants, and two-stage submersible filter pump. The lights are out under the tank so it illuminates from the bottom. This gives the table a lovely glowing effect. This item does have a few downsides though. The table isn’t recommended for a home with big pets or small children. While the table is decently sturdy it still won’t stand up against moderate misuse. This makes it harder to own for many households in the world. The Midwest Tropical Fountain 25 Gallon Aqua Coffee Table Aquarium Tank is the most expensive option on this list. It is a more classic looking table though that may work better for most homes. The tank itself is still smaller in size and won’t work well for larger fish. In fact, it may not work well for some medium breeds. This table measures 15.5 x 24 x 24 inches. This table weighs in at around 100 pounds. This makes the product net impossible to move when it’s full of water. Like stated in the table’s title, it can hold up to 25 gallons of water. This limits the size and amount of fish in the tank. The table is a standard Four sides piece of furniture that matches most living rooms. The top of the table is made out of glass. The base and the tank itself is made out of more durable acrylic. The product is made in the USA and recommended for freshwater fish. With this table, you will receive quite a few items. You get a filter, pump, aerator, decorative plants. You will also get blue gravel and an LED light. This light is placed in the base of your tank and illuminates from the bottom. The base also helps to hide the filter. This tank does have a few cons though. The acrylic with this tank can scratch easily. This can turn your tank into an eyesore. 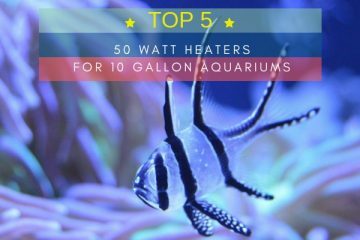 It’s also not recommended to use a heater as it will fog up the inside of the aquarium. This prevents you from having several fish breeds. 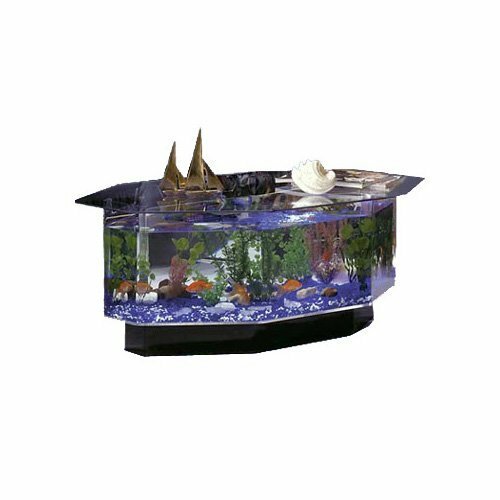 The Midwest Tropical Fountain Aqua End Table Aquarium Tank is another classic design. 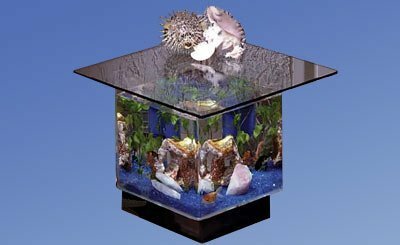 This is a smaller model of table aquarium that is perfect for small sections. This table will fit perfectly beside your couch or even your bedside. Despite the small size, this tank is gorgeous. This tank measures 21 x 21 x 21 inches and only weighs around 56 pounds. This is a classic four-sided table design that fits in well with other furniture. This tank only holds up to 15 gallons of water. That means you can have only smaller breeds of fish. The tank is made of both acrylic and glass. The top of the table is the glass part. The bottom and the tank is made completely of acrylic. The top is ⅜ of an inch thick. This helps the table stay durable for years to come. With this product, you will get a quiet filter. This fits in perfectly with your table without sticking out. You will get a light for illumination. To hide the light you get a free bag of blue glass gravel. The light included with this tank gives it an even more elegant look. This table does have a few downsides. These tables don’t hide the filter very well. Many buyers may think that this looks poor with their tank. You will also notice that it is hard to add accessories to the tank. As with most items, there are some things you need to think about before purchase. This is a more niche type of tank and comes with its own unique set of challenges to overcome. In addition, you still need to think about regular tank challenges. To start with, what type of fish do you plan to get for this tank? It’s extremely important to decide this as each breed has different requirements. You should also note that you may not find a table to fit your selected breed of fish. Many of the coffee table tanks aren’t huge in size. 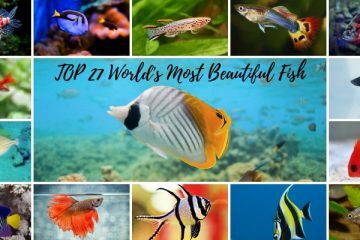 Even with the biggest model on this list, you won’t be able to accommodate some fish. It’s best to stick with medium to small breeds if possible. Just make sure they will get along with each other. Next, consider what your breeds of fish will need. Some fish will need extra heat in their tank. This could be a challenge too properly fit into the table. You also may find that bulky accessories ruin the ambiance of your nice living room table. Next, you will want to consider adding in algae eaters. These fish will help break down waste in your tank. This is especially important if you want to keep the table looking as nice as possible. These fish are usually cheap to buy and require little attention. Having a powerful filter is a must. Without using a filter your water will get dirty quickly. This can make your table become a hassle thanks to frequent cleaning. Make sure to still do regular water changes to keep your tank topped off. If you plan to have a coral reef or a planted tank you may have trouble. These types of tanks tend to put the LEDs on the bottom. This doesn’t really help grow any plants. These types of tanks aren’t suited for growing any type of live vegetation. The safety of your fish should also be a huge concern. This tank won’t be out of the way like most. Accidents do happen and it may be hard to have rambunctious animals or young children with this item. There made strong, but can scratch or break. Many fish also don’t like loud noise. If you use the table to sit your items on frequently it may stress them. This can lead to your fish becoming sick. While most tables work to keep the noise level down they can’t stop everything. Lastly, consider why you want this tank. For some fish hobbyist the limitations, it present may be too much. For some beginners, the stress of keeping it crystal clear may be annoying. Make sure you can handle the cleaning process. Now that you’ve seen our best fish tank coffee tables you may have made a choice. Make sure to make notes of how many gallons each table holds. Compare this to the needs of your selected fish. Also, consider which room you want to put the table into for display. Each of these items has some pros and cons. These tables are beautiful editions to any home but require some work. Make sure you’re ready to keep your table clean for guests and your family. Also, make sure that your fish aren’t too stressed out by their new tank.